Peer-reviewed publications are one measure of research productivity. Throughout the history of our Center, we have been exceptionally productive in this area. 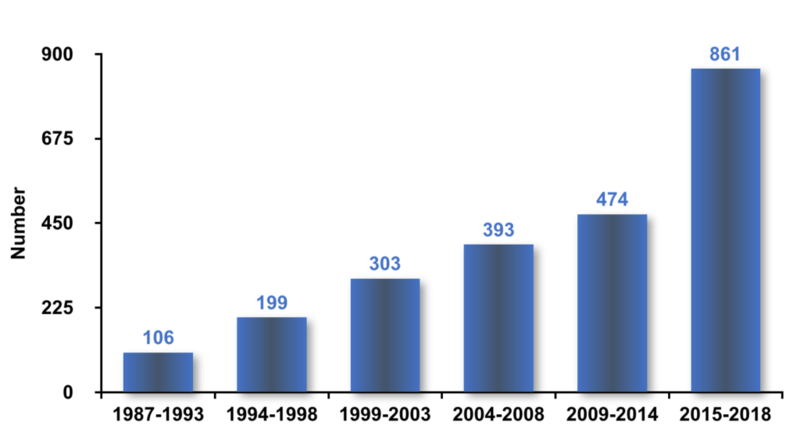 We have built up an infrastructure that sustains research teams in injury and violence prevention (IVP), and as a result, publications have steadily increased over time. On average, the IPRC core and affiliate faculty publish nearly 100 IVP prevention papers per year. Click here to view publications by the IPRC’s core and affiliate faculty. The mission of Injury Epidemiology is to advance the science and practice of injury prevention and control through timely publication and dissemination of peer-reviewed research. Injury Epidemiology aims to be the premier venue for communicating epidemiologic studies of unintentional and intentional injuries, including, but not limited to, morbidity and mortality from motor vehicle crashes, drug overdose/poisoning, falls, drowning, fires/burns, iatrogenic injury, suicide, homicide, assaults, and abuse. UNC faculty, staff, and students can access the journal here. The Journal of Primary Prevention (JOPP) publishes manuscripts that address the prevention of high risk behaviors, the reduction of associated problems and harms, and the promotion and maintenance of healthy functioning and psychosocial wellness. We publish a wide spectrum of studies that include the epidemiology and determinants of high risk behavior and environments, as well as the development, evaluation, translation, sustainability, and costs and benefits of preventive interventions. UNC faculty, staff, and students can access the journal here. Hard copy issues of JOPP from 1981-2008 through volume 29, can be found in the Davis Library on UNC Chapel Hill’s campus. The Journal of Family Violence (JOFV) is a peer-reviewed publication committed to the dissemination of rigorous research on preventing, ending, and ameliorating all forms of family violence. JOFV publishes scholarly articles related to the broad categories of child abuse and maltreatment, dating violence, domestic and partner violence, and elder abuse. Within these categories, JOFV emphasizes research on physical violence, psychological violence, sexual violence, and homicides that occur in families. Studies on families in all their various forms and diversities are welcome. UNC faculty, staff, and students can access the journal here. Hard copy issues of JOFV from 1986-2008 through volume 23, can be found in the Health Sciences Library on UNC Chapel Hill’s campus.